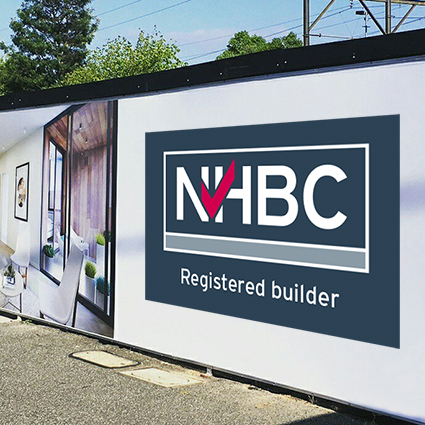 Position this NHBC registered builder hoarding near your site entrance for maximum impact. The A1 panel (measuring 594mm x 841 mm) will show your professional commitment and demonstrate to customers that your homes are of a high standard. NHBC only accepts builders and developers who can demonstrate financial security and technical competence onto its register. We carry out commercial and technical assessments of all applicant builders and developers before offering ‘registered’ status, and all registered builders agree to comply with the NHBC Rules and build homes to the NHBC Standards of construction. Builders registered with NHBC benefit from a range of products and services which are designed to help them build quality homes throughout each build stage, as well as a range of NHBC branded materials to help successfully sell them. Registered builders have access to free industry news and updates, are able to use the NHBC logo in promoting their business and developments, and receive support throughout the entire development process.